Bill Ford says move isn't a gesture, company expects a return on its investment. 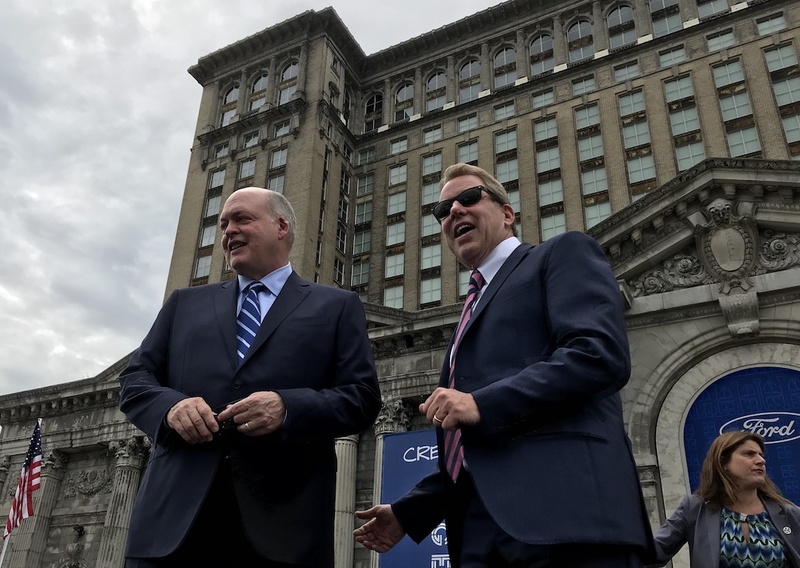 Ford CEO Jim Hackett, left, and Bill Ford share a laugh after the announcing the company's plans for the Michigan Central Station in Detroit. In a ceremony that was equal parts pep rally, political rally and outdoor concert, Ford Motor Co. officially told the world it would be putting its new most precious resource – its mobility campus – in the city of Detroit in a yet-to-be-renovated train station. The automaker purchased the Michigan Central Station, once the hub of train travel in and out of Detroit, for an undisclosed sum. Bill Ford Jr., founder Henry Ford’s great grandson and current company chairman, also declined to say how much the company would spend renovating the structure. Ford also was quick to note that even through the company was in the midst of a cost-cutting effort that was initially set at $14 billion and has since gone up to $25 billion, the acquisition of the building and some of the surrounding ones and property parcels fits within the company’s belt-tightening measures. He noted that the cutting costs doesn’t mean ending investment in the company’s growth. He said the company set aside monies for this type of growth in 2016 and this project would come out of those funds, not hampering the company’s effort to be better with a buck. Perhaps more importantly, he wanted to be clear that the automaker isn’t just doing this to be a good neighbor. Ford Chairman Bill Ford laid out the plans for the automaker's new campus in the Corktown neighborhood in Detroit. Corktown is the oldest neighborhood in Detroit, originally home to Irish immigrants from the County Cork in Ireland. Once home to working class families, it went into decline in the wake of the race riots of 1967. It is only the last decade or so that it has started coming back with restaurants, barbershops and other retail mixed with some renovated housing. Ford kickstarted the interest in the area when it purchased an old former factory earlier this year, naming it “The Factory” and shifting 125 employees to the site to begin working on Ford’s mobility projects. It then proceeded to buy more than 1.2 million square feet of property with intention of making it the hub of the company’s mobility enterprise. It will be home to more than 2,500 Ford employees and ideally another 2,500 non-Ford employees will lured to the renovated station in the form of suppliers, start-up companies and retailers. 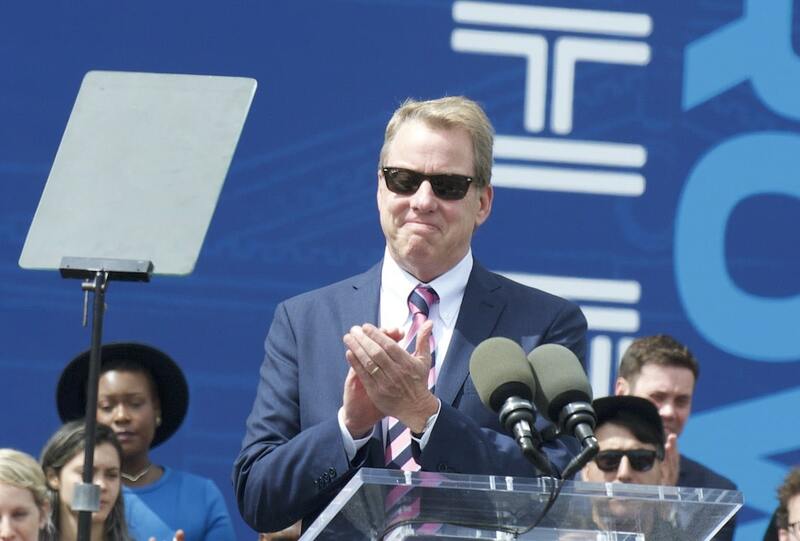 Bill Ford, who described how he was awestruck he first few times he entered the station as a child, was ebullient standing on the stage set up in front of the building. “Today I’m more hopeful about this city than ever,” he proclaimed as the crowd cheered. 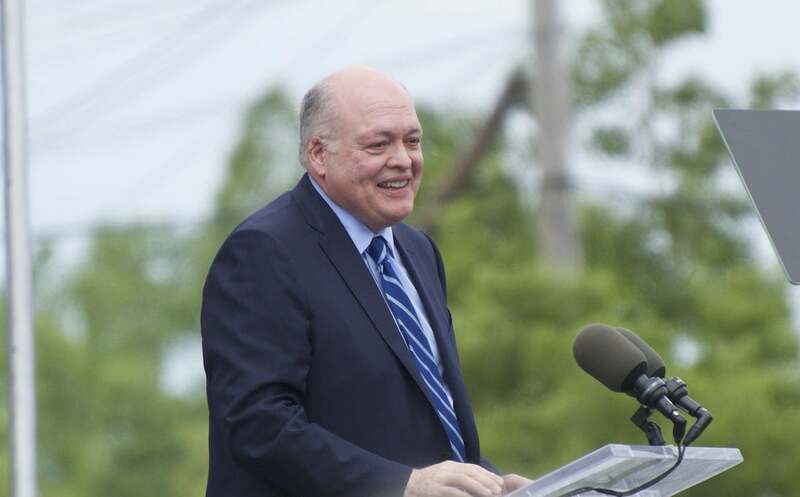 Ford CEO Jim Hackett explains the company's future plans for the Michigan Central Station. The automaker is not only trying to act “as an anchor” for the community’s revitalization, but also sees very tangible benefits from having its mobility operations in the city. Not the least of which is that it’s a draw for talented people. The company declined to elaborate on how much it will cost to renovate the dilapidated station that has seen much of the plumbing scavenged from it. It was only last year that the former owner, Matty Moroun, reportedly Detroit’s largest, single property owner, spent $8 million putting new windows in to the structure and getting some of the elevators working. Former CEO Ford said it was too soon to say with certainty when the first employees will show up for work in the tower, but he felt 2022 was a safe timeframe to expect the site to house employees. “I’ve already had some of our employees ask when they could move over and I’ve had to tell them it was too soon know that,” he said after the event. Ford’s current headquarters in Dearborn, Michigan, is less than 20 minutes away from the site. This entry was posted on Tuesday, June 19th, 2018 at and is filed under Automakers, Automobiles, Autonomous Driving, Business, Driverless Vehicles, Environment, Executives, Ford, Personalities, Safety, Semi-autonomous Driving, Technology, V2V. You can follow any responses to this entry through the RSS 2.0 feed. Both comments and pings are currently closed.